This film departs from Wilde’s narrative in such an astonishing way that I had to grab my copy of the novel and look up the ending while the credits were still rolling. To say it takes some liberties is an understatement. While there are major weaknesses present, there are also moments of fully realized decadence that Wilde would not have committed to paper. 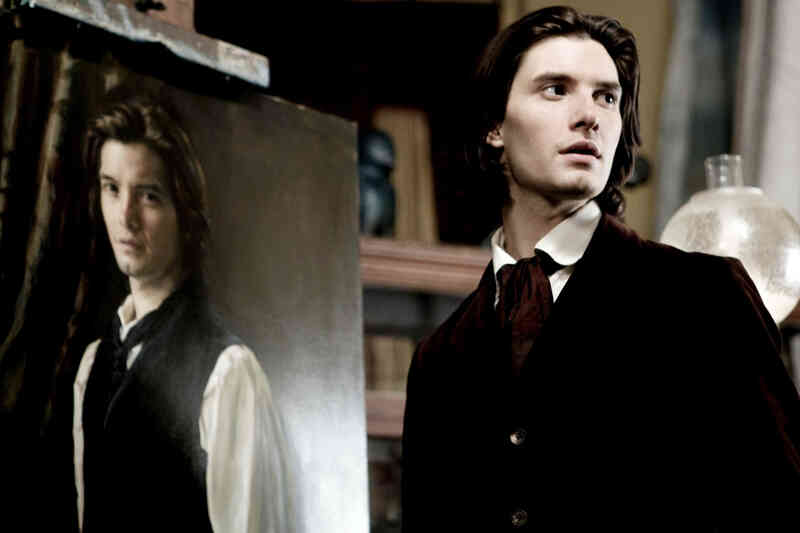 Ben Barnes plays the devastatingly handsome Dorian Gray. Though not the blonde Adonis Wilde writes, Barnes is indisputably magnetic as the aesthetic anti-hero. From the beginning, there are signs that the movie internalizes our modern pop-psychological tropes. For example, Dorian is occasionally haunted by memories of his abusive father. We see Dorian as a child cowering in the attic (where else?) as his father hunts him down with verbal and physical abuse. This is just the first concession to modern sensibilities in which all bad choices are predestined by previous abuse and all villains have a tragic secret. Dorian’s childhood abuse in this case seems to serve to make his a sympathetic figure in the audience’s eyes, whereas Wilde’s Dorian was more perfectly privileged, a boy unmarked by life when Henry Wotton first lays eyes on him. I suppose that for modern audiences to follow Dorian’s descent into wickedness and subsequent redemption, some groundwork must be laid in the language of victimization that we all speak now. Here, also, is one of the greatest flaws in this film: the erasure of the aesthetic as motivation. Wotton has devoted himself to a life of surfaces. His epigrammatic pronouncements are sharp as needles and with nearly as much substance. It is in imitation of Wotton’s life of aesthetic indulgence that Dorian begins his foray into vice. The film casts Colin Firth as Henry Wotton and Ben Chaplin as Basil Hallward. Hallward’s painting captures Dorian in perfect youth. When Wotton asks if he would sell his soul to be so eternally perfect as his picture, Dorian swears he would and the film suggests this exchange is made with a few music-video flashes and chiming noises. Firth delivers his lines in a clipped, aggressive cadence that make his words seem like aural stabs. His Wotton remains grim-faced and serious in pursuit of momentary distraction from ennui. Wotton’s goading begins with pressing a cigarette on Dorian and before long, he is vicariously living through Dorian’s conquests: a memorable one including seducing a high society matron while her teenage daughter–with whom Dorian was occupied moments before–hides under the bed. The film presents lush interiors and the smoke-filled private pleasure clubs of the London upper class as the backdrop to Dorian’s ever more daring indulgences. Wotton begins to exhibit jealousy when Dorian falls for the stage actress Sybil Vane. Couching his opposition in terms of class, Wotton attempts to pull Dorian away from marriage to Sybil. He sows his final seed of discord by provoking an argument between Sybil and Dorian. This, I believe, is only to set the stage for Wotton’s eventual redemption as well. In the book, Dorian breaks his engagement with Sybil because he witnesses her bad performance in a play. Rather than make the point of stress between Dorian and Sybil aesthetic, the film chooses to side once again with modern sensibilities and raise the spectre of social disapproval, which we all know from having read Romeo and Juliet was a thing that messed up a lot of love stories in old-timen days. Sybil does an Ophelia after Dorian leaves her. Dorian, for his part, continues his life of opium dens and bordellos. His portrait, long hidden in the attic, begins to exhale ragged breaths and drop maggots on the floor. After Hallward’s repeated insistence that Dorian display the painting again, he meets his end as Dorian reveals the portrait in the attic and then stabs Hallward with a shard of mirror. There is one point just before Dorian kills Hallward that does seem to go further than the book dared to: the scene in which Dorian kisses Hallward. This kiss is immediately followed by the fatal thrust of the glass. Here the undercurrent of homosexual desire that Dorian inspires in Hallward is made momentarily explicit. What Wilde could only hint at, this film shows. In a most ungentlemanly move, Dorian disposes of Basil’s body himself. Following his foray into murder, Dorian leaves for an extended jaunt to the continent. Dorian returns after 20 years to a London of motor coaches and cameras. Here is where the film really loses it way. Dorian falls in love with Wotton’s thoroughly modern daughter. While the film constructs a demonstrably contemporary woman in Gladys–she smokes, she forgoes the complex frills of Edwardian dress, she’s constantly taking photos of Dorian–it necessitates transforming a minor character from the book into Wotton’s daughter. In the book, Dorian is idly involved with a country girl of the lower classes. In this film, Dorian’s affair with Gladys Wotton is detailed through her attempts to defang his arch pronouncements and her full faith in Dorian’s redemption. But this is nothing new. Its is the role of beautiful women in film and fiction to serve as saviors of men through love. Of course Dorian must come to salvation through Wotton’s daughter since his fall was largely due to Henry’s tutelage. Wotton spends the rest of the movie casting suspicious glances at Dorian that lead the viewer to believe that Henry suspects Dorian in Hallward’s death but does not explain why. I suppose it can be read under the old cliche that the father scrutinizes the partner of his daughter on her behalf. This part of the film falls flat for me. It may be that this version of the story takes it for granted that the audience wants to see Wotton atone for his part in Dorian’s corruption. This question of the love interest as the savior is one that movies lean on heavily. It seems almost as if the film expects that the audience will find the notion that Dorian will decide to destroy the enchanted portrait through his own internal motivation unacceptable. I doubt Wilde would have taken seriously the notion that the romantic love of a woman is what the aesthetic anti-hero needs to return to humanity. This addition is generated by a modern audiences’ expectations. While the figure of Gladys in the film is compelling as she bursts Dorian’s epigrammatic pronouncements, she seems more like an intrusion from another narrative universe. In the end, Wotton takes it upon himself to destroy Dorian’s portrait, and, in the process, Dorian himself, complete with the movie cliche of exploding balls of fire. Why does this film choose to let Wotton destroy Dorian rather than allow Dorian to destroy himself? On the one hand, the film posits Dorian as such a perfectly pleasure-seeking subject it may be difficult to believe he retains any concern about the nature of his soul: Dorian as postmodern narcissist. While Gladys attempts to save Dorian from the blaze, he turns away from the possibility of escape. Dorian does eventually stab the portrait as in the book, but only when he has already accepted his impending death by fire in the attic. This strikes me as lesser than Dorian’s choice of death in the novel, since it makes his act in destroying the painting less impactful. After all, the painting is already on fire are sure to be destroyed anyway. It always struck me that what really tormented Dorian was not a lot of internalized moralistic blah blah, but rather the idea that there existed somewhere an accurate image of him. It’s the ugliness of the painting that destroys his illusions of a purely aesthetic life. The idea that available to any witness is an interpretation of himself that he cannot control and manipulate is what I think really spurs Dorian to destroy the painting. This entry was posted on February 23, 2011 at 2:27 pm and is filed under Movies with tags aesthetics, beauty, Dorian Gray, gothic, grotesque, ideology, morals, Oscar Wilde, supernatural, vice, women. You can follow any responses to this entry through the RSS 2.0 feed. You can leave a response, or trackback from your own site. Oooh! I’m so sold on this now. I was writing on this book when I left the MA program at UCF. Have to watch this now, thanks. I liked the film as a Gothic movie, as something to watch curled up under a duvet nabbed from the bed on the sofa with my partner. I was terribly upset at Hallward’s murder in the film. Seems far more fitting to the character as a man who becomes the ultimate shallow narcissist.